One of Handsomepant’s co workers shared with us that she was pregnant so I immediately set to work on this little quilt. Unfortunately I don’t remember the name of the fabric I used, but I’m pretty sure it’s from Moda. The backing was from a sheet set I bought from Target on super clearance to help supplement my fabric stash. The squash blossom blocks measure 12” square and I used a layer cake of the main fabric and some plain white fabric from my stash. I like the look of the squash blossom block, and related blocks, because of how geometric they are. Something about half square triangles look like they should be difficult, but in reality are rather easy. Maybe it’s the drama they add to a quilt pattern, but I find squash blossom blocks receive lots of compliments. The only thing about this quilt that really makes it a baby quilt is it’s size. I suppose it would be categorized a lap quilt because it’s only 36 x 48”. The fabric is more sophisticated than a traditional baby quilt, and that fits with the style sense of myself and Handsomepant’s cor worker. I like a baby quilt that the child van grow up with. The quote on the quilt tag is something we have on the kids wall in their bedroom, you can find it here. I converted it into a miniature version and embroidered it with a back stitch. I think I’ll use it on other quilt tags because it’s awfully cute! Grandma Ginger has been busy making baby quilts for a while. 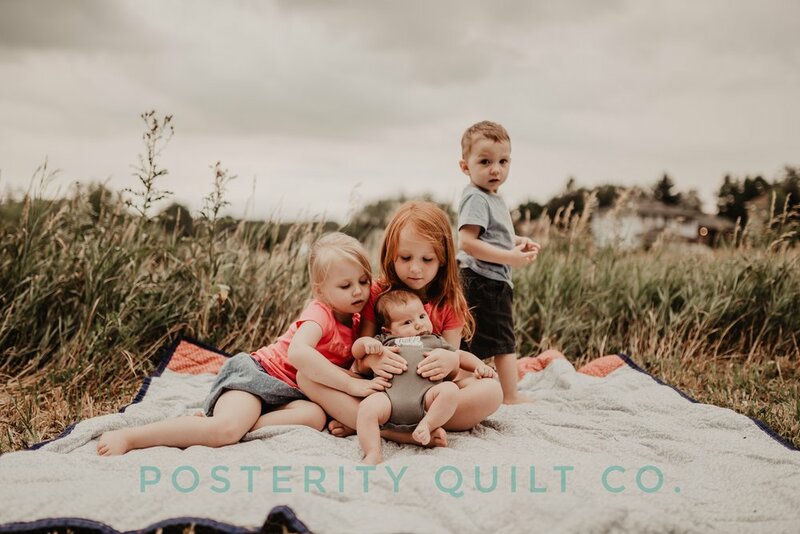 Over the last seven years she’s been blessed with nine grand children, and she’s never missed a baby quilt for any of them. A few weeks ago this arrived in the mail and it’s been put through the ringer already! Between baby “fluids”, sticky toddlers, and dropped snacks this quilt has been washed a number of times in the few weeks we’ve had it. Wince recently discovered his toes. I tried to get a good shot of it and failed, Ginger used a feathered design for the quilting. It’s quite cute and adds to a well-used look on the quilt. This quilt is so soft and pliable, I wish my quilts were like hers. Maybe I need to wash them a few time once finished. The little duckies where then all appliqued on top of the quilting. I love that they have wheels instead of feet. They remind me of an old fashioned pull toy. Wince sure is pleased with his new quilt! The blues came from Ginger’s stash. The woman practically has a store in her house! The backing is a chevron printed fabric with ombre blues that match the pinwheels on the quilt top. The binding is a matching batik, and of course Ginger hand sewed the binding. I know there’s contention between hand sewn and machine sew binding, but it’s something she likes to do in the evening when sitting in the living room with my father-in-law before bed. This year some friends from church announced they were pregnant with their first child and they were having a little girl. I was so excited for them, and so resigned to my own commitment to limiting our family to 6 members total, I did the unthinkable. I unpacked and rewashed all girl clothes from newborn to 3T, picked out my favorites to turn into a quilt, and gave everything else baby girl oriented to this couple. You heard right, I have resigned myself that Wince is the last child in the Wahn household. I actually made this quilt shortly after M was born but for some reason, despite being one of my favorite quilts that I’ve made, I never really used it and it sat on a shelf for a while. I usually like to have a few finished baby quilts on hand so that I’m not rushed to make a new quilt when I need a gift. For those of you who follow my blog, you might remember that I had to resort to pre-made baby quilts when Little Man was born. I was convinced that he was going to be born a girl, but when I returned home from the hospital I had to pull something blue out of the closet instead! This quilt was made with a charm pack of Moda’s Farmhouse fabric and some Kona solids I had in my stash at the time. I designed the quilt to be a crib quilt and to have odd dimensions, 35 x 55”, just slightly larger than a standard crib mattress. Because I intended the quilt to be used more for decoration and to probably be slept on rather than slept under, the large sides of the quilt can be safely tucked down between the crib and the mattress. The quilting was also intended to keep the fluffiness of the quilt to a minimum, so I used 4 oz. batting and top stitched the quilt 1/4” apart. Personally I’m a fan of top stitching. It’s clean and simple and the more the better, but it can take a long time to finish, especially if you keep the rows tight. I particularly like the stark contrast of the white stitched against the scarlet backing. I used white thread throughout the quilt, partly because I like the look, and largely because that was the only thread color available to me at the time. But on the quilt front you can hardly notice the color difference. Unfortunately I was forced to miss the baby shower for Ms. K because A nasty stomach flu decided to hit me the night before. David was forced to deliver the quilt me and he made a hasty retreat from the flock of excited ladies and pink decorations and spent the day keeping the kids away from my corpse on the couch. He’s an awesome husband! 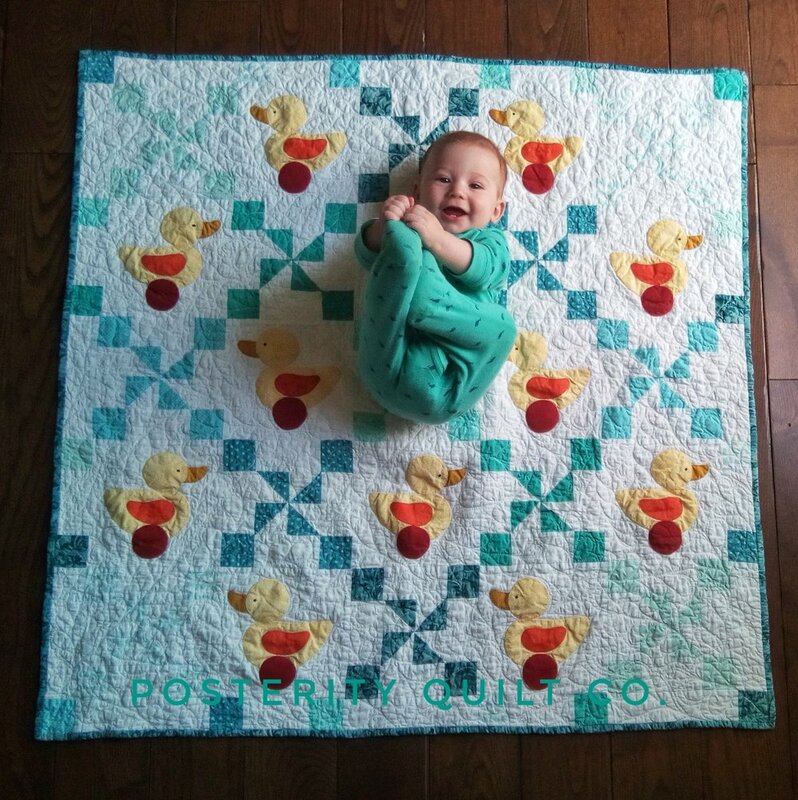 I know I’ve given away all of our girl stuff, but this quilt is so cute I might be inspired to try to talk Handsomepants into just one more kiddo. 5 kids is a nice round number right! For those of you who keep tabs on my quilting (or used to), you probably noticed that I disappeared from the blog scene for several months. You might also remember that I was expecting Wahn child #4. Well Wince arrived slightly early in June, and I’ve been run ragged ever since. Wince is the easiest baby in the world, but there is a special kind of challenge that comes with raising three young children and caring for a new born with practically no sleep. Unfortunately quilting, let along blogging, took a seat on the side line. Little Man has become a Little Critter. I am so thankful that he is a curious, inquisitive little boy, but I’m not thankful that his curiosity often leads him to pull apart the house and climb into or on top of the refrigerator! Everything in our house is either locked up, bolted to the wall or bungee corded together. M has certainly taught me patience and humility in parenthood. She decided to completely revert in her potty training (she was doing so well!). She had such a sudden 360 with constant accidents that I actually had her tested for diabetes. Thankfully she’s perfectly healthy, but I’ve had to resign myself to the fact that she would rather sit in a puddle and keep playing than spend 1 minute in the bathroom. “It’s just a phase” has become a mantra I repeat multiple times a day. Goose has been busy with first grade and loves to show off her reading skills by reading to Wince every day while I cook dinner. She’s also quite proud of the programming robot her teacher entrusted her with at home (she attends a STEM charter school). And Wince is so sweet and easy going, I’m contemplating asking Handsomepants for just one more baby. He thinks we’re done, but I’m not quite ready to let go of this stage of life. So here’s my explanation for ghosting my very own blog. I completely allowed the 1930’s Farmer’s Wife series to fall flat, but I’m working double time to try to catch up on those posts. I’ve been catching up on posts on a number of baby quilts I have made and gifted over the last two years. And recently I’ve been thinking about learning to hand quilt, so look forward to some posts on that! A big shout out to my friend Srna for these amazing pictures! She’s taken all of our newborn and 1 year photo sessions. If anyone is in Colorado and you’re interested in scheduling a session, here’s a link to her Facebook page. In Germany, Hitler's Nazi party had a solid foundation in the German government. Recent elections in the Reichstag, called by Hitler, gave the Nazi party enough seats to operate as an independent majority rather than a coalition government. While Hitler's regime had not yet turned bloody (Night of the Long Knives would take place within a month), the Nazi Antisemitism policy expanded from the political sphere to the social. Joseph Goebbels restricted film and theater actors from performing if they were not part of a national union, and of course, those actors of Jewish dissent were banned from union membership. Goebbels also introduced bans on all foreign films with Jewish cast members. The first film affected by this ban was the British film The Rise of Catherine the Great because its lead actress, Elisabeth Bergner was Jewish. The United States had its fair share of Antisemitism sentiments between the KKK and the American branch of the Nazi Party (although it never was endorsed by Hitler). But for the most part, Americans were more preoccupied with survival in a depressed economy. 1933 was the worst year for American unemployment at 26%, and while March was still early in the year for American agriculture to take a deep hit, but workers in the industrial sectors of the American economy where feeling the pinch even when they had a job. New York City cab drivers went on a week long strike in support of union recognition. New York City officials banned parades and other forms of public congregation after the striker's demonstrations turned into violent riots that left hundreds injured and thousand of dollars in damages of small businesses. Roosevelt was able to postpone strikes led by over 100,000 workers in the American auto industry by contacting strike leads and promising mediation. Roosevelt created the National Automotive Labour Board that mediated issues between the auto workers and their employers. The National Automotive Labour Board was a subsidary of the National Labour Board, and administrative organization created by the Roosevelt administration designed to negotiatedisputes that arose as a result of the National Industrial Recovery Act of 1933, a piece of legislation that allowed the president executive powers to regulate the wages and prices of private companies. I think it's a wonderful juxtaposition between the depressing economic situation in the United States, and the attitude of Emancipated in her Letter To The Editor. While so many Americans were busy keeping a roof or a tent over the heads of their families, Emancipated decided to appreciate and celebrate what little time this life gives us with our families. Rather than become a slave to the responsibilities of life, Emancipated chooses to spend a weekend playing with her children. In her own words: "... we've quite merely existing... no unmindful of our obligations, but never again will they engulf us!" What a great reminder to focus on the things that matter in life, our loved ones. Enjoy them and our time with them while we still can. 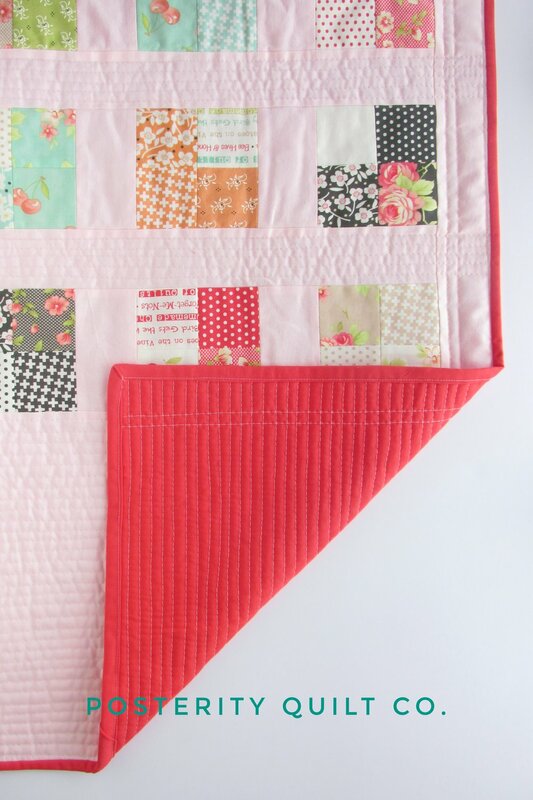 The Becky block is a cinch to piece, just start with the smaller pieces and build your way up! The only thing you really need to keep in mind is keeping seam allowances properly aligned. Because the pieces of this block all have 45* angles, keep those seams strait so that you don't end up with a wonky block, unless that's the look you're going for! A (1) 2 1/2 x 6 1/2"
B (1) 2 1/2 x 3 3/4"
C (1) 2 1/2 x 3 1/2"
D (1) 2 1/2 x 3"
E (1) 1 1/2 x 2 1/2"
F (2) 1 1/2 x 1 1/2"